Full casting for Edward Albee’s The Goat, or Who Is Sylvia? is announced today. Joining Damian Lewis and Sophie Okonedo, who play husband and wife Martin and Stevie in Ian Rickson’s production, will be Jason Hughes as Martin’s oldest friend Ross and newcomer Archie Madekwe as their son Billy. Ian Rickson will be joined by an Olivier and Tony Award winning creative team in Rae Smith (set and costume design), Neil Austin (lighting design) and Greg Clarke (sound design), with an original score by PJ Harvey. Jason Hughes is perhaps best known for his television work, which includes playing lawyer Warren Jones in the BBC TV series This Life and as Detective Sergeant Ben Jones in Midsomer Murders from 2005 until 2013. A respected stage actor, his previous work includes Our Country’s Good and Look Back in Anger opposite Michael Sheen at the National Theatre, Violence and Son and 4.48 Psychosis for the Royal Court and US tour, Way Upstream at Chichester Festival Theatre, Caligula at the Donmar Warehouse and Design for Living at Theatre Royal, Bath. Archie Madekwe makes his professional stage debut as Billy. Prior to this he trained at LAMDA. Previous work includes Fresh Meat and Casualty, as well as the films Legacy and Second Coming. Archie also appeared in National Youth Theatre’s 2013 production of Pope Joan at St James’s Church Piccadilly. 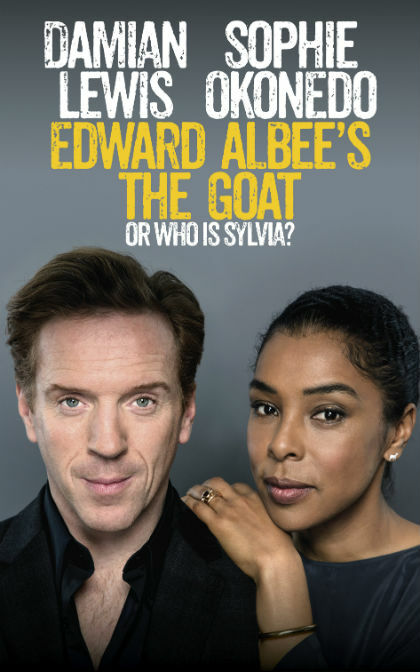 Edward Albee’s The Goat, or Who Is Sylvia? will play a limited 12 week season at the Theatre Royal Haymarket from 24 March to 24 June 2017 and is produced by Matthew Byam Shaw, Nia Janis and Nick Salmon for Playful Productions, Tom Kirdahy and Hunter Arnold.